During its five season run, Breaking Bad had the best cars on television. (These days that award probably goes to Archer, of course.) None of Breaking Bad's cars were flashy, high-end exotics like some Michael Bay movie, they were just unusual, fascinating choices that seemed to suit the people who drove them. I'm happy to see its prequel, Better Call Saul, will carry on this tradition. Before Breaking Bad, the Pontiac Aztek was a total joke, a rolling monument to Old GM's managerial incompetence. (And let's be honest, it still pretty much is.) But Breaking Bad had the unusual effect of redeeming the Aztek to an extent. Now, it wasn't just an ugly, failed early crossover, it was "Walter White's Car." That show was the best thing that ever happened to it. This story from Esquire makes me wonder if Better Call Saul could do the same for the Esteem, an unusual sedan that isn't as reviled as the Aztek, but has definitely been lost to the annals of time. I'll admit I couldn't even place it at first glance until I saw its badge. The show takes place in 2002, years before Breaking Bad, so I'm not sure what kind of punishment this poor Esteem took in just four years, but it had to have been brutal. 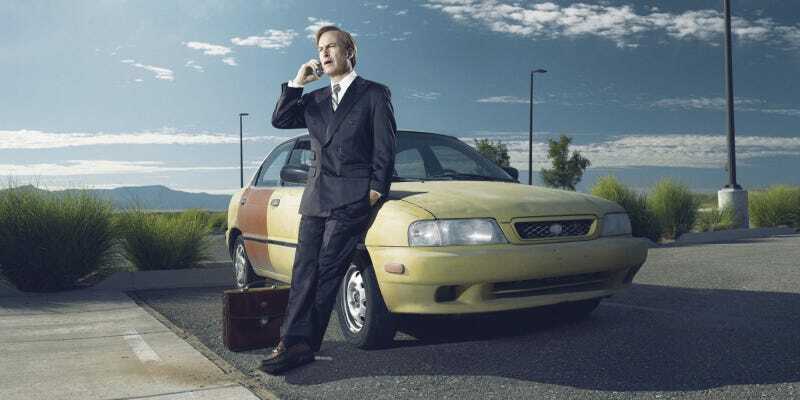 Belching smog and with faded yellow paint and a mismatched door, it's the ride of choice of cash-strapped lawyer/con-man Jimmy McGill before he becomes the infamous mob lawyer Saul Goodman. In its sorry state, Jimmy's Esteem (pun very much intended by Saul's producers) is more a reflection of its owner's unrealized potential, and throughout the pilot, this stubborn survivor of Jimmy's tragicomic misfortune, including a smashed windshield thanks to some scheming skateboarders, becomes not only a visual metaphor for McGill/Goodman, but a character of its own. I look forward to more adventures with the Esteem before it gets replaced with the white Cadillac DeVille Saul drives in Breaking Bad. In the meantime, if you want to learn more about the history of the Suzuki Esteem — and who doesn't! — check out Esquire.